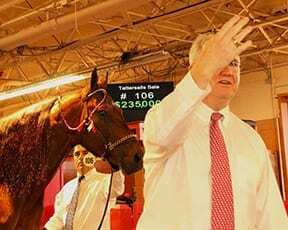 Today, some of these queries were answered at the Tattersalls Spring Mixed Sale at the Meadowlands Racetrack in East Rutherford, NJ. Overall, the sale enjoyed a 12.6% increase in average ($23,556) and a 3.3% increase in gross sales ($2,379,200) for 101 horses sold compared to last year’s inaugural Tattersalls Spring Mixed sale. On the seasoned racehorse side, Hip 105 Warrawee Needy is one of four horses in the history of the harness racing to go in 1:46.4, the fastest race time ever. In fact, the night before the sale he paced one of the fastest miles of the season at Yonkers Raceway, 1:50.4h, beaten just a head at the wire. That return to form made the $1.2 million dollar winner a very hot commodity, and was hammered down for $260,000 to Mark Ford, Agent. A horse that created some buzz over the weekend was Hip 84, Thats My Opinion. Ultimately sold for $60,000 to Andy Miller, Agent, the son of Somebeachsomewhere finished second beaten half a length by Foiled Again in a Meadowlands qualifier on Saturday. He paced his mile in 1:51 and finished ahead of such notable horses as Bettor’s Edge and McWicked. Originally a $350,000 yearling purchase, the colt looks to finally be coming into his own. The highly anticipated 2-year-old portion of the sale saw Hip 2, Backfrom The Brink, a Western Terror colt and a former $24,000 Harrisburg yearling RNA, top the pacing 2-year-old portion. Owned by Brivina Stable, and broken and trained by Tony Alagna, Alagna thought enough of the horse to sign the ticket as agent for $60,000 for one of his Canadian clients. Alagna also bought the topped trotting colt, Hip 9, Rocky Hanover, for a hammer price of $50,000 on behalf of an Alagna client. The son of Cantab Hall enjoyed increased interest by performing well in a baby race the day before the sale. For the most part, the 2-year-olds were well received, especially those that trained or raced the weekend of the sale. They averaged $18,173 for the 14 sold. Tattersalls will conduct the Summer Mixed Sale at The Meadowlands on Sunday, August 2nd during Hambletonian week.